You boot into Safe Mode to fix things. So it’s not right when Safe Mode ends up being the thing that needs fixing. If your Windows computer insists on booting into Safe Mode, you’ll have to figure out what’s causing the problem. What made you go into Safe Mode in the first place? I assume you did it intentionally, but how? If you did it through the System Configuration tool, that’s your problem. Step 1: Right-click on the Win logo in the lower left corner of Windows 10 desktop or press Win + X keyboard shortcuts, and then in the popped menu click Run to open Run dialog box. Step 2: Type msconfig and click OK. This will open System Configuration dialog. Step 3: Select Boot tab. Untick the Safe boot checkbox under Boot options. Then click Apply and OK. Step 4: Click Restart to restart your computer to make the changes take effect. After computer boots up, Windows 10 will directly get into its normal mode. 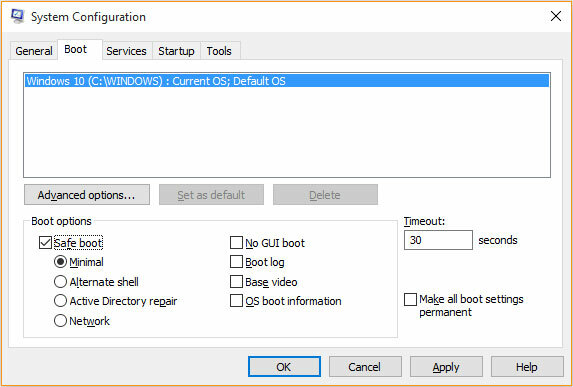 The above is the common way to help you get Windows 10 computer out of safe mode and access its normal state. Of course, the ways also apply to other versions of Windows.